A confession: The art of frittata-making eluded me for a very long time. 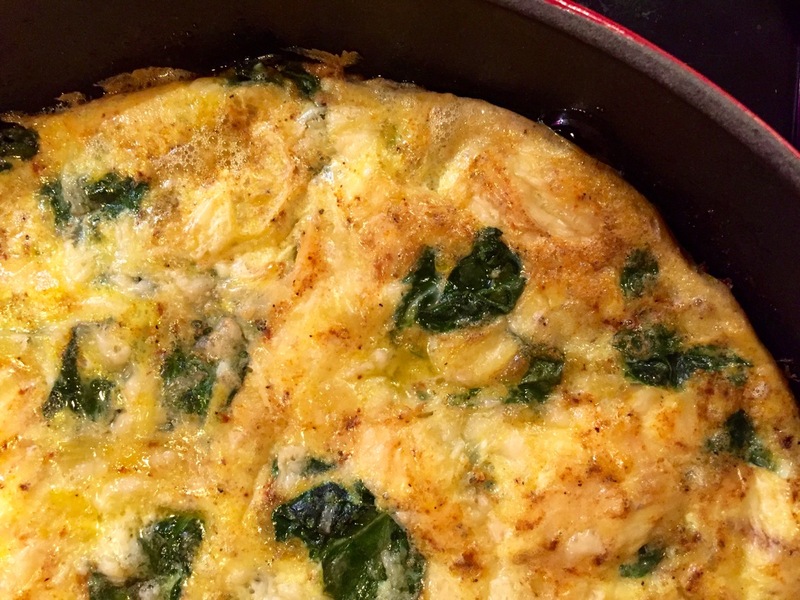 This spinach garlic frittata is a hard-won victory for me. Every recipe I tried went like this: In an oven-proof skillet, sauté the fillings on the stovetop, pour in beaten eggs, continue to cook on the stovetop until almost done, then broil until puffed and brown. Sounds easy, right? Except… mine never worked. Ever! It would always burn either top or bottom, possibly both, and it would stick to the pan, requiring a long soak to clean up. Sigh. I had almost given it up for lost, until I came across this easy frittata recipe for kids, using a simple baking method. I thought to myself: Surely I can make this if kids can make this. Right?! Right! Guess what – this method totally works. No burning, no sticking to the pan. Hurrah! The great thing about frittatas is that you can use any veggies you have on hand, so feel to modify to your needs. Go ahead, use that asparagus, kale, or whatever you have. And if you have leftover frittata, it is delicious in a sandwich the next day. Equipment: 12-inch ovenproof skillet (such as enameled cast iron) for frittata; medium bowl for eggs; medium skillet to saute fillings. Prepare the frittata skillet: Preheat oven to 350 degrees F. Prepare the 12" ovenproof skillet by coating it with 1 T. of the olive oil and placing it in the oven to preheat. Prepare the fillings: Beat the eggs in a medium bowl with the salt & pepper and set aside. In a medium skillet, heat 1 T. of olive oil over medium-high heat. Add spinach and garlic, then cook and stir for about 2 minutes until the spinach has just wilted. Assemble and bake the frittata: Remove the preheated oiled 12" ovenproof skillet from the oven. Dot the spinach-garlic mixture (filling) evenly over the bottom of the skillet. Carefully pour the eggs over the filling. Do not stir at at this point - you want to preserve the oil coating on the skillet. Sprinkle the grated cheese on top, and place back in the oven. Bake for 25-30 minutes or until eggs are set. When done, sprinkle with a little extra grated cheese if desired. Cut into wedges to serve. Enjoy! Did you like this post? Subscribe by email (up top) for more fun, fresh vegetarian and seafood recipes! This is a radish*rose recipe inspired by the source(s) named above. All images & content are copyright protected. All rights reserved. Please do not use my images without prior permission. If you want to republish a recipe, please credit radish*rose and link back to the recipe.